When Charles Parsons invented the Turbine Engine in 1884, shipping lines such as Cunard looked to this new technology as a way to power large transatlantic liners. The turbine offered great potential over the traditionally used reciprocating engines due to its smaller size, improved efficiency and reportedly lower maintenance costs. However shipping lines were used to the operation of reciprocating technology. As a result of this, Cunard opted to build two near identical ships, the Caronia and her sister Carmania, which both entered service in 1905. At the time the two liners were the largest ships in the Cunard fleet. Cunard used turbines aboard Carmania while Caronia was competed with standard reciprocating engines of the quadruple-expansion type. Caronia was launched in July 1904 and departed Liverpool on her maiden voyage, bound for New York, on 25 February the following year. Caronia with her reciprocating engines proved to be slower than Carmania, while also being more costly to operate. This test case convinced Cunard to use Turbines on the forthcoming greyhounds, Lusitania and Mauretania. During Caronia’s third transatlantic voyage, she became stranded off Sandy Hook which caused a great delay to the voyage; however fortunately there was minimal damage to the ship. 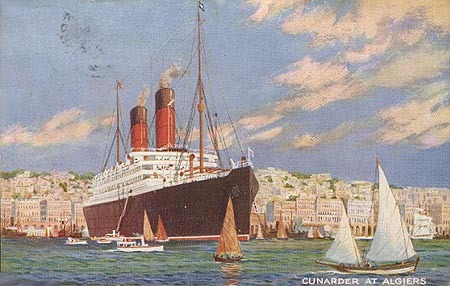 Cunard ran Caronia on their premiere transatlantic route from Liverpool to New York until the outbreak of World War I. During the war, Caronia was used as an Armed Merchant Cruiser. She was commissioned into the Royal Navy on 8 August 1914 and during her first week in this role, Caronia captured the German ship Odessa which was carrying a cargo of nitrate. Caronia was later allocated to patrol the seas near the Ambrose lighthouse at the entrance to New York Harbour. On 14 April 1915, Caronia collided with the schooner Edward B. Winslow while operating as an armed cruiser. There were no casualties and with minimal damage, the ship was able to continue on this role until May 1915 when she returned to Liverpool for a mechanical refurbishment. Caronia returned to America and performed contraband patrols off New York before again returning to Liverpool, this time to be released from British Naval service. She returned to Cunard on 7 August 1916 and after a refit, she was unexpectedly requisitioned by the British government this time to carry out trooping duties between Halifax and Liverpool. Caronia continued in this role until the end of the war, at which time she assisted in the repatriation of Canadian troops. Caronia was finally returned to Cunard and re-entered commercial service on 12 September 1919. She was utilised on the London to Halifax service, and after an extensive refurbishment in 1920, was utilised on the Liverpool to New York and Boston service. In 1926 the passenger accommodation underwent a complete overhaul to accommodate 452 cabin class, 365 tourist class and 650 3rd class passengers. This configuration was done with cruising in mind, and to that end in the winter season Caronia undertook cruises between New York and Havana. By the end of 1931 the Caronia was showing her age, and no longer profitable. With the onset of the Great Depression, Caronia was laid up at Sheerness. In January 1932 the Caronia was sold for scrap, and prepared for a voyage to Hughes Bocklow & Co. However, she was resold to a Japanese ship-breakers who renamed the ship, Taiseiyo Maru, for her voyage to the breakers yard in Osaka. Check out chrisframe.com.au for more cruise ship and aviation information including news, video and photos.